Hummingbird is the common name for any of the strictly New World birds comprising the family Trochilidae, characterized by small size, often brilliant colors in the males, a slender bill, and the ability to hover while rapidly beating their wings. There are over 300 species of hummingbirds. Hummingbirds are the smallest of all known birds. They are remarkable for their ability to hover in midair by rapidly flapping their wings up to 80 times per second (depending on the species). They are capable of sustained hovering and are the only birds able to fly backwards ( Ridgely et al. 2001) or vertically, and to maintain their position in mid-flight while drinking from flower blossoms. Hummingbirds are named for the characteristic humming sound made by their wings. The males often have a stunningly beautiful iridescent plumage that covers the whole range of colors from red and yellow to green and indigo. So striking is their coloration that some have referred to them as "flying jewels." 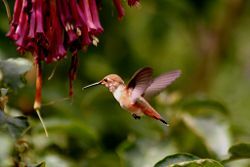 Hummingbirds are attracted to many types of flowers, including shrimp plants, bee balm, heliconia, butterfly bush, hibiscus, bromeliads, cannas, verbenas, honeysuckles, salvias, pentas, fuchsias, and penstemons. It is often stated that they are especially attracted to red and yellow flowers. They feed on the nectar of these plants and are important pollinators, especially of deep-throated flowers. Many species of hummingbird also eat insects and spiders. While ecologically the role of hummingbirds as pollinators and insect controls is of great importance, for humans they offer another value, adding wonder and beauty to the experience of nature. Hummingbirds are the masters of feathered flight with a combination of speed, maneuverability, and dazzling beauty considered unequaled by any other bird. Looking like high-speed flying emeralds or rubies, their ability to stop, hover in mid-flight, and then fly in reverse, is a feat that continues to astound the best aeronautical engineers. Most of what is known about the behavior of hummingbirds comes from observations of the ruby-throated hummingbird. This is the most common hummingbird in the eastern United States. Iridescent plumage coloration in a male Anna's hummingbird. A male Costa's hummingbird, showing its plumage to good effect. Hummingbird in Golden Gate Park, San Francisco. The hummingbird is a small bird with a long, thin beak. This elongated beak is one of the defining characteristics of the hummingbird, which, with an extendable, bifurcated tongue, allows the bird to feed upon nectar deep within flowers. A hummingbird's lower beak also has the unique ability to flex downward to create a wider opening, facilitating the capture of insects in the mouth rather than at the tip of the beak (Omara-Otunnu 2004). The bee hummingbird (Mellisuga helenae) of Cuba is the smallest bird in the world, weighing 1.8 grams (g) and measuring about 5 centimeters (cm). 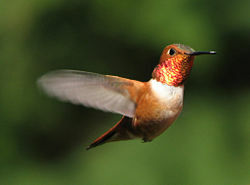 A more typical hummingbird, such as the rufous hummingbird (Selasphorus rufus), weighs approximately 3 grams and has a length of 10–12 cm. The largest hummingbird is the giant hummingbird (Patagona gigas) of the Peruvian Andes, which may weigh as much as 24 grams and measure 21.5 cm. Hummingbirds are some of the most strikingly colored specimens in the entire bird world. They display sexual dimorphism, with the males more brightly colored than the females (Camfield 2004). Male plumage may be metallic red, orange, green, or blue. Some have only an iridescent cap or throat patch, called a gorget, while others, such as the coppery-headed emerald are entirely iridescent (Roberson 2006). Hummingbird nest with two chicks in Santa Monica, California. Hummingbirds are found only in the Americas, from southern Alaska and Canada to Tierra del Fuego, including the Caribbean. The majority of species occur in tropical Central and South America, but several species also breed in temperate areas. Excluding vagrants, sometimes from Cuba or the Bahamas, only the migratory ruby-throated hummingbird breeds in eastern North America. The black-chinned hummingbird, its close relative and another migrant, is the most widespread and common species in the western United States and Canada. A migrating ruby-throated hummingbird can cross the 500 mile stretch of the Gulf of Mexico on a nonstop flight, a trip estimated to take about 20 hours. This hummingbird, like other birds preparing to migrate, stores up fat to serve as fuel, thereby augmenting its weight by as much as 40–50 percent and hence increasing the bird's potential flying time ( Skutch et al. 1973). Most hummingbirds of the United States and Canada migrate to warmer climates during the Northern Hemisphere winter, but some remain in the warmest coastal regions. Some species in southern South America move to the tropics during the Southern Hemisphere winter. The rufous hummingbird shows an increasing trend to migrate east in winter to the eastern United States, rather than south to Central America, possibly because of artificial feeders provided by hummingbird lovers. In the past, individuals that migrated east would usually die, but now many survive, and their changed migration direction is transferred to their offspring. Provided sufficient food and shelter is available, they are surprisingly hardy and able to tolerate temperatures down to at least -4° F.
The male ruby-throated hummingbird arrives at its breeding ground in early spring, several days before the female. His arrival is timed to the opening of several nectar-bearing flowers. He then stakes out his territory and will chase away other males. Many species of hummingbirds do not sing, and the songs of those that do sing would not be described as melodious. Some have described them as insect-like clicking, raspy jittering, or high-pitched squeaking. Those species that produce pleasant songs are in the minority. The white-eared hummingbird produces a rapid clicking song that some might call pleasant. In the blue-throated hummingbird, both males and females sing. The female has a different song than the male and she usually sings when she is within centimeters of the male (Ficken et al. 2000). 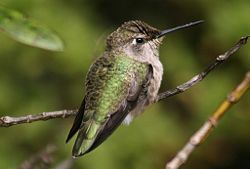 In the mating flight of the male ruby-throated hummingbird, the suitor flies several feet above the female, who is sitting on a branch close to the ground. He then dives down toward her in a J-shaped pattern, coming within inches of his intended mate. He will repeat this several times. Most male hummingbirds mate with more than one female and they form no pair bonds. Males usually take no part in building the nest or caring for the young. The female makes a neatly woven, cup-shaped nest, about the size of a walnut shell, on a tree branch, 1 to 70 feet above the ground. The nest may use spider webs, lichens, mosses, and fibers from insects or plants. Two or three white eggs are laid, which, despite being the smallest of all bird eggs, are in fact large relative to the hummingbird's adult size. Incubation takes 14–19 days. The birds leave the nest 20–25 days after hatching (Cassidy 1990). A trail of wake vorticies generated by a hummingbird's flight. Discovered after training a bird to fly through a cloud of neutrally buoyant helium-filled soap bubbles and recording airflows in the wake with stereo photography (Rayner 1995). Hummingbird flight has been studied intensively from an aerodynamic perspective. Hovering hummingbirds have been filmed using high-speed video cameras. The giant hummingbird's wings beat 8–10 times per second, the wings of medium-sized hummingbirds beat about 20–25 times per second, and the smallest species beat 70 times per second with some unsubstantiated reports of speeds up to 200 times per second (Elert 2006). The rufous hummingbird, Selasphorus rufus, was studied in a wind tunnel and the lift generated on the bird's upstroke and downstroke was investigated. They concluded that these birds produced 75 percent of their weight support during the downstroke and 25 percent during the upstroke. This finding shows that a hummingbirds' hovering is similar to, but distinct from, that of hovering insects such as the hawk moths (Warrick et al. 2005). Long-tailed hermit hummingbirds were clocked at an average speed of 25.7 mph along a 40-meter course. Others found that ruby-throated hummingbirds could not make any progress in a wind tunnel with a headwind of 26 mph (Gill 1985), so this would seem to be their maximum flight speed. With the exception of insects, hummingbirds, while in flight, have the highest metabolism of all animals, a necessity in order to support the rapid beating of their wings. Their heart rate can reach as high as 1,260 beats per minute, a rate once measured in a blue-throated hummingbird (Chambers 2007). They also typically consume more than their own weight in food each day, and to do so they must visit hundreds of flowers daily. They are capable of slowing down their metabolism at night, or any other time food is not readily available. They can enter a hibernation-like state known as torpor, in which the heart rate slows to 50 to 180 beats per minute. Their rate of breathing can also slow dramatically. Traditionally, hummingbirds (family Trochilidae) were placed in the order Apodiformes, which also contains the swifts. In the Sibley-Ahlquist taxonomy, hummingbirds are separated as a new order, Trochiliformes, but this is not well supported by evidence. Hummingbirds' wings are hollow and fragile, making fossilization difficult and leaving their evolutionary history a mystery. Some scientists believe that the hummingbird evolved relatively recently. 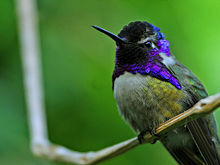 Scientists also theorize that hummingbirds originated in South America, where there is the greatest species diversity. Brazil and Ecuador contain over half of the known species. However, the ancestor of extant hummingbirds may have lived in parts of Europe in what is southern Russia today. A hovering rufous hummingbird on Saltspring Island. There are between 325 and 340 species of hummingbird, depending on taxonomic views, and these are divided into two subfamilies: (1) Phaethornithinae (the 'hermits') and (2) Trochilinae (typical hummingbirds). The Phaethornithinae consist of 6 genera with about 34 species and the Trochilinae consist of 101 genera with about 306 species. Genetic analysis has led to speculation that the hummingbird lineage diverged from their closest relatives some 35 million years ago, in the Late Eocene. Fossil hummingbirds are known from the Pleistocene of Brazil and the Bahamas—though neither has yet been scientifically described. There are fossils of a few extant species, but until recently, older fossils had not been securely identifiable as hummingbirds. In 2004, two 30-million-year-old bird fossils were identified as hummingbirds (CBC 2004). The fossils of this primitive hummingbird species were named Eurotrochilus inexpectatus ("unexpected European hummingbird"). They had been sitting in a museum drawer after they had been unearthed in Germany. But because it was assumed that hummingbirds never occurred outside the Americas, they were not recognized as hummingbirds until a reexamination. Fossils of birds not clearly assignable to either hummingbirds or a related, extinct family, the Jungornithidae, have been found at the Messel Pit and in the Caucasus, dating from 40–35 million years ago (mya), indicating that the split between these two lineages occurred around that date. The areas where these early fossils have been found had a climate quite similar to the northern Caribbean or southernmost China during that time. The biggest remaining mystery at the present time is what happened to hummingbirds in the roughly 25 million years between the primitive Eurotrochilus and the modern fossils. The astounding morphological adaptations, the decrease in size, and the dispersal to the Americas and extinction in Eurasia all occurred during this time span. DNA–DNA hybridization results suggest that the main radiation of South American hummingbirds partly took place in the Miocene, some 13–12 mya, during the uplifting of the northern Andes (Bleiweiss et al. 1999). 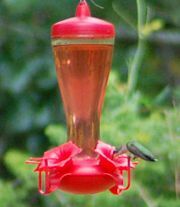 Hummingbirds will either hover or perch to feed, and red feeders are preferred. In addition to their very important role as pollinators, many people like to have hummingbirds around their gardens and flower beds because of their beauty and unique behavior. The diet of hummingbirds consists of nectar and a protein source, such as small insects or spiders. The safest way to provide nectar for hummingbirds is to plant some of the many flowers that are attractive to them. Through careful planning, gardens may contain plants that bloom at different times to attract hummingbirds throughout the seasons. Placing these plants near windows affords a good view of the birds. Many people prepare artificial feeders with sucrose solutions. Hummingbirds can distinguish between feeding sources that differ in sugar concentration by only a few percent, and the more aggressive bird will make the more concentrated feeder its own and allow the smaller birds to eat from the other more dilute feeder. Hummingbirds have been photographed feeding from a container of sugar water while perching on people. These birds will also hover within inches of people in order to feed. Hummingbirds sometimes fly into garages and become trapped. Once inside, they may be unable to escape because their natural instinct when threatened or trapped is to fly upward. This is a life-threatening situation for hummingbirds and they can become exhausted and die in possibly as little as an hour. If a trapped hummingbird is within reach, it can often be caught gently and released outdoors. It will lie quietly in the space between cupped hands until released. Aerial photograph of hummingbird image at Nazca in Peru. The history between hummingbirds and humans is ancient. The Aztec god Huitzilopochtli is often depicted as a hummingbird. The Nahuatl word huitzil (hummingbird) is an onomatopoeic word derived from the sounds of the hummingbird's wing-beats and zooming flight. The Ohlone or Costanoan people tell stories of hummingbirds and coyotes (Kroeber 1907) . Linda Yamane, a Rumsien Ohlone, has written about the role of hummingbirds in ancient myth (Yamane 1995). Trinidad and Tobago is known as "the land of the hummingbird," and a hummingbird can be seen on that nation's coat of arms, its one-cent coin, as well as its national airline, Caribbean Airlines. In Brazil, a black hummingbird of any kind is a sign of death in the family, especially if it is inside the house. Bleiweiss, R., J. A. W. Kirsch, and J. C. Matheus. 1999. DNA-DNA hybridization evidence for subfamily structure among hummingbirds. Auk 111(1): 8–19. Retrieved September 17, 2007. Camfield, A. 2004. Trochilidae. Animal Diversity Web. Retrieved August 9, 2007. Canadian Broadcasting Corporation (CBC). 2004 . Oldest hummingbird fossil found. CBC News. Retrieved September 17, 2007. Cassidy, J., ed. 1990. Book of North American Birds. New York: Reader's Digest Association. ISBN 0895773511. Chambers, L. 2007. About hummingbirds. Retrieved August 11, 2007.
del Hoyo, J., A. Elliott, and J. Sargatal, eds. 1999. Handbook of Birds of the World, Volume 5: Barn-owls to Hummingbirds. Barcelona: Lynx Edicions. ISBN 8487334253. Elert, G. 2006. Frequency of hummingbird wings. The Physics Factbook™. Retrieved September 5, 2007. Ficken, M. S., K. M. Rusch, S.J. Taylor, and D. R. Powers. 2000. Blue-throated hummingbird song: A pinnacle of nonoscine vocalizations. Auk 117(1): 120–128. Retrieved September 17, 2007. Gerwin, J. A., and R. M. Zink. 1998. Phylogenetic patterns in the Trochilidae. Auk 115(1): 105-118. Retrieved November 21, 2007. Gill, F. B. Hummingbird flight speeds. Auk 102(1): 97–101. Kroeber, A. L. 1907. C3. Rumsien, Costanoan. Coyote and the hummingbird. In Indian Myths of South Central California, University of California Publications in American Archaelogy and Ethnology, volume 4, number 4, 199–202. Retrieved September 17, 2007. Meyer de Schauensee, R. 1970. A Guide to Birds of South America. Wynnewood, PA: Livingston. Omara-Otunnu, E. 2004. Hummingbird's beaks bend to catch insects. Advance. University of Connecticut. Retrieved August 9, 2007. Rayner, J. M. V. 1995. 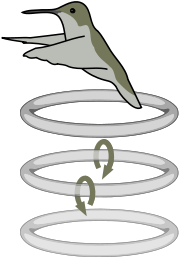 Dynamics of vortex wakes of flying and swimming vertebrates. J. Exp. Biol. 49: 131–155. Ridgely, R. S., and P.G. Greenfield. 2001. The Birds of Ecuador: Field Guide. London: Christopher Helm. ISBN 0713661178. Roberson, D. 2006. Hummingbirds: Trochilidae. Monterey Bay. Retrieved August 10, 2007. Skutch, A. F., and A. B. Singer. 1973. The Life of the Hummingbird. New York: Crown Publishers. ISBN 051750572X. Warrick, D. R., B.W. Tobalske, and D. R. Powers. 2005. Aerodynamics of the hovering hummingbird. Nature 435: 1094–1097. Yamane, L. 1995. When the World Ended, How Hummingbird Got Fire, How People Were Made: Rumsien Ohlone Stories. Oyate. ISBN 9780962517518. This page was last modified on 3 April 2008, at 21:28.